To her shock, Blake offers her a trade. She'll get his income, his house, his car. In exchange, he'll work her hours and send money home to her family. No expectations; no future obligations. But before long, they're trading not just lives, but secrets, kisses, and heated nights together. No expectations might break Tina's heart...but Blake's secrets could ruin her life. I loved this book. The build-up to animosity, then friendship to love, the tension, chemistry – it was very well done. I felt the love this couple generated for each other and it warmed me. But there are 3 love stories here: the hero and heroine’s love/romance; plus the love between the protagonists and their parents. Two diverse families demonstrated love in different ways, but both heart-warming. “I have a problem,” oh, the clues were all there and once the reveals happened I wondered how I hadn’t guessed all of them. 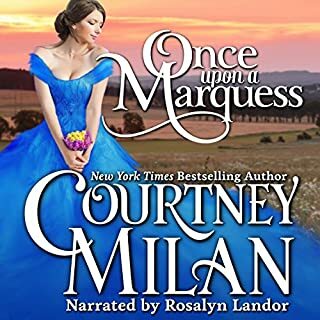 Courtney Milan is a master of Grand Gestures saving the day when you think all is in turmoil. I was bowled over by the grand gestures here. 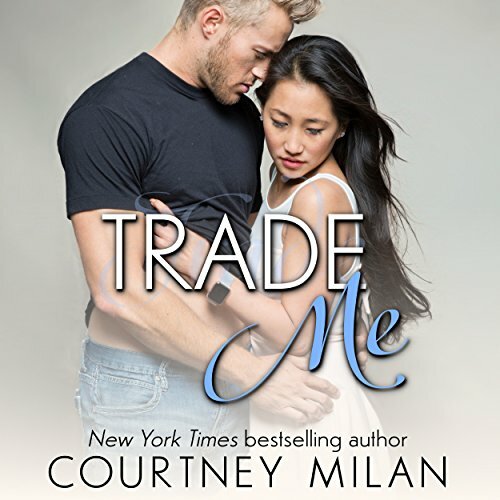 I recommend any Courtney Milan romance novel – historical or contemporary. They leave you with a big, happy sigh. I listened on Audible and I loved, LOVED, the narrators Xe Sands and Sean Crisden. They created an ‘addictive-listening’ pleasure with their wonderful performances. I couldn't pause the audio. What did you love best about Trade Me? Tina. She was a relatable character me being 2nd generation American myself! What was one of the most memorable moments of Trade Me? When Tina played his dad when she first met him. She was FIERCE! Any scene Tina was in! She stole the show! Stunning writing and performance. Beautifully written with lots of attention to detail and satisfying connections between various subplots. The performance does the writing justice. I found some of the falsetto voices distracting, but not actually irritating. Xe Sands gives a spectacular performance, with great pacing and nuance. This book has more profanity than I was comfortable with, but it was believable within the story. Courtney Milan is a goddess. This story made me laugh, cry, and swoon. Absolutely sublime. This book has a unique plot which I really appreciate. Endearing characters and excellent narration make this book one of my top picks. Can’t wait to dive into the sequel. loved the dynamic between Blake and his dad. never did I expect that twist! so much fun with this one! I Loved this Book. It showed that no matter What you have going on in your life someone else maybe able to help you. I’ve discovered a hidden gem in this story! Oh wow. This story was really as pleasure to listen to. 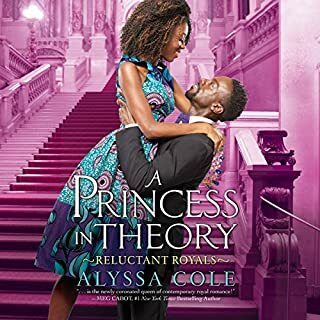 I came upon it by browsing audible Romance Package titles, and the cover caught my attention. The beautiful couple features an Asian female with a White male. Then reading the synopsis that this was a hate-love type of romance...yup, that sealed it. Tina Chen is a “starving student” at Berkeley. Blake is also a student, but one with privilege. He’s student and protege of his father, the CEO of Cyclone systems, a tech company akin to the real-life Apple Inc. When Blake makes an ignorant remark about economic class structure, Tina doesn’t stay silent; she criticizes his remark and hypothesizes that Blake would not be able to survive should he trade places with her. Blake takes her up on this offer and proposes a plan where they would be essentially swapping roles for the rest of the semester. Tina is intelligent, witty, and very headstrong. But she’s also a worry-wart and is fiercely protective of her family, like me. This I think made me identify with her character so much. Blake initially appears to be the typical arrival rich college guy, but as the story progresses, more angsty layers are revealed. I absolutely loved the incorporation of Tina’s family who all immigrated from China to the U.S. The cultural aspects that were woven into the story showcased an everyday-in-the-life of a first generation Chinese-American family. It was refreshing. The female narrator, Xe Sands, delivers great narration, especially reading parts referencing Chinese dialogue or names. She gave a life to characters like Tina’s mother and siblings, adding the just right amount sarcasm in her voice that I was endlessly smiling and amused throughout the scene! The POV alternates to Blake, read by Sean Crisden. His narration was ok for me. The “female voice” he adopts for Tina’s dialogue wasn’t the greatest. It really sounded like an exaggerated male voice trying to portray a female voice... think Mrs. Doubtfire. Overall, I was impressed with the storyline and sassy smart dialogue between all the characters. I loved how each character developed, challenged each other, and grew into better selves. And most of all, I loved the twists and turns this story took. They were unexpected, and I enjoyed the ride it took me on. This was my first exposure to any of Courtney Milan’s stories. 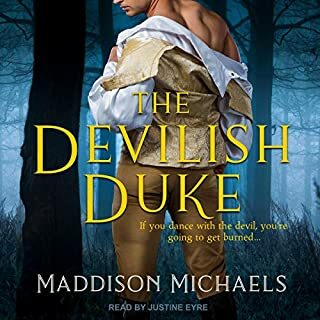 It appears she’s primarily a historical romance writer (not my favorite genre), but this is the first book in her Contemporary romance series and I will be following her for future reads!